It's time for the final part of my spring make up re-jig, sad times I know but its all about lip products so it'll be a good'un. 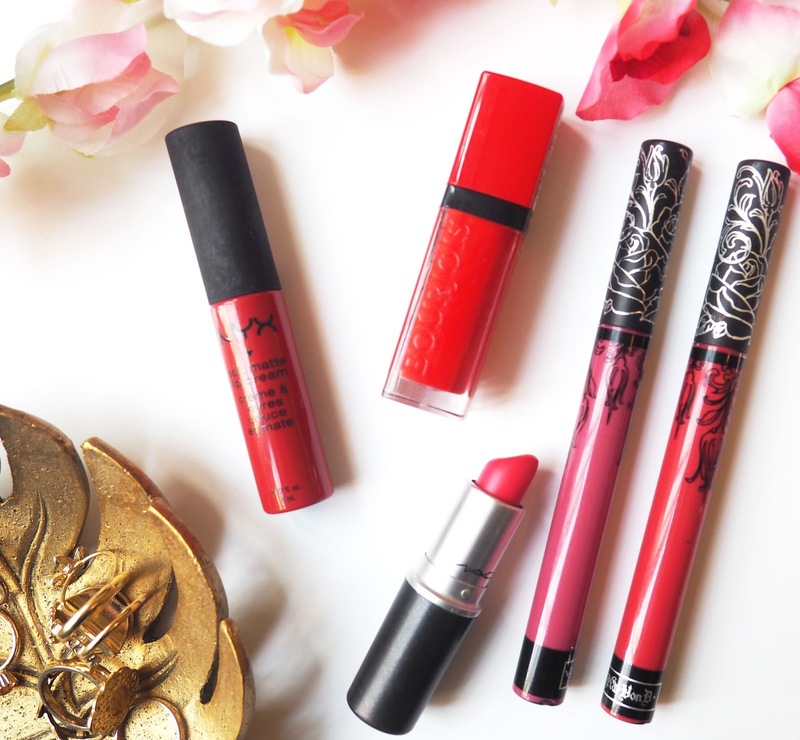 Spring looks for me have got to incorporate a bold, bright lip every now and again so I've picked out a few bits along those lines. First up I just love a pop of vibrant red, there is just something about a red lip with a simple eye look that is perfect. It's one of those ones thats simple to put together but looks like you've made such an effort. The Bourjois Rouge Edition Velvet in Hot Pepper has a little of an orange under tone to it which I think makes it very Spring/Summer appropriate. The Nyx Soft Matte Lip Cream in Amsterdam is another good bright red option but I would say this is more of a true red, in the swatches below you can see it is a lot less orange than the Bourjois one. If you haven't tried these before then have a snoop at my Nyx Soft Matte Lip Cream Stash post but to sum it up these are very light and comfortable to wear with an almost whipped texture. Mac Impassioned is one I always go back to as the weather starts to warm up, think something that Barbie would wear! This is actually one of the first Mac lipsticks I owned so it holds a special place in my heart for that reason too. It's an 'Amplified' finish which means its very pigmented and is a little creamier than a matte lipstick so much less drying. I've worn this all day to festivals before and it's stayed put with minimal reapplying needed- hooray! Again, I would wear this with quite a simple eye look, it looks amazing with a soft bronze eye. As you may know I use the Kat Von D Everlasting Liquid Lipsticks quite regularly and fortunately I have a couple of brighter shades to hand. Both of these shades fit in the 'pink' category but are in no way similar to each other. 'Berlin' is a very hot, almost red pink and whilst 'Mother' is still bright and will make an impact its much more on the mauve side and I have to say, I love a mauve. These lippies really do pack a punch colour wise and something like this is just so fun to wear. What lippies do you love to wear in the warmer months? I hope you've all enjoyed my Spring Update series and have a fab summer! Love the look of the Everlasting Lipsticks, the shades are so vibrant and pretty!